FOR three full quarters, Jeremy Lin couldn't buy a basket to save his life. He missed 10 of 11 shots and had misery written all over his grief-stricken face. But when the game hung in the balance, the phenomenon known as Linsanity roared back to life as the surging New York Knicks eluded a meltdown and eked out a narrow 82-79 victory over the Sixers on Wednesday night at the Wells Fargo Center in Philadelphia. Lin scored 16 of his 18 points in the final frame, including 10-for-10 from the free throw line to help New York ward off the hostile Sixers, who never led throughout the contest but crawled to within 71-73 with 3:05 to go. 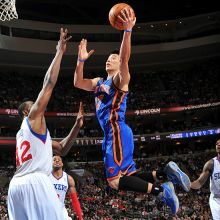 Lin also had 5 rebounds and 3 assists. It was the Knicks' fifth consecutive win, all under interim head coach Mike Woodson, who took over the resigned Mike D'Antoni. The 23-24 Knicks are currently 8th in the Eastern Conference's playoff picture, a full game ahead of the 21-24 Milwaukee Bucks, who are also on a tear, winning six straight. Amare Stoudemire led New York with 21 points on 8-of-14 shooting. But the rest of the Knicks, who shot just 29 of 79 overall (36.7 percent), struggled to score. Carmelo Anthony missed 10 of 15 shots but managed 10 points. JR Smith sank only 3 of 11 shots for 8 points and Lin went just only 4-of-17 overall. In a match-up between two defensive heavyweights, the Sixers struggled to score as well, converting just 29-of-75 shots for a weak 38.7 percent clip. The Sixers were more than decent from beyond the arc, 8-of-17, but they clunked five free throws (13-of-18) which proved fatal in a nip and tuck affair. Jrue Holiday paced the Sixers with 16 points while three of his teammates -- Andre Igoudala, Louis Williams and Jodie Meeks -- finished with 13 apiece. Ex-Bull Elton Brand had a huge double-double with 12 points and 12 rebounds. ELSEWHERE in the NBA Wednesday night, the Spurs gave the visiting Minnesota Timberwolves a 116-100 beatdown at the AT&T Center in San Antonio. The Spurs had a scoring jamboree with six players notching double figures in points led by the ageless Tim Duncan who had 21 and 15 rebounds. Kawhi Leonard, Gary Neal and Stephen Jackson had 16 points apiece while Danny Green had 14. Tiago Splitter added 11. J.J. Barea led the Timberwolves with 18 while Kevin Love had another routine double-double, 17 points and 12 rebounds. The Spurs improved to 30-14 in the standings, second-best in the West Conference behind the 35-12 Oklahoma City Thunder. Minnesota fell to 23-25.